The Seven Spiritual Laws of Success — Abridged "One Hour of Wisdom" Edition (eBook) - Amber-Allen Publishing, Inc. This pocket-sized “One Hour of Wisdom” edition of Deepak Chopra’s classic bestselling book, The Seven Spiritual Laws of Success, offers powerful pearls of wisdom and a life-altering perspective on the attainment of success. In less time than it takes to prepare yourself a meal, you can learn what it takes to be successful in all areas of your life. You can have material wealth, vibrant health, energy and enthusiasm for life, and fulfilling relationships. Chopra shatters the myth that success is the result of hard work, exacting plans, or driving ambition. Once you discover the natural laws that govern all of creation, and align with these laws, success comes easily and naturally. 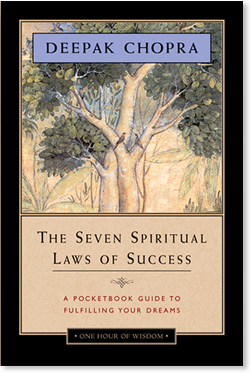 Carry this wisdom in your purse or in your pocket, read it on the go, and reinforce The Seven Spiritual Laws of Success that will change your life forever. This book is titled The Seven Spiritual Laws of Success, but it could also be called The Seven Spiritual Laws of Life, because these are the same principles that nature uses to create everything in material existence — everything we can see, hear, smell, taste, or touch. When this knowledge is incorporated in our consciousness, it gives us the ability to create unlimited wealth with effortless ease, and to experience success in every endeavor. Success in life can be defined as the continued expansion of happiness and the progressive realization of worthy goals. There are many aspects to success; material wealth is only one of them. Moreover, success is a journey, not a destination. Material abundance, in all its expressions, happens to make the journey more enjoyable, but success includes good health, energy and enthusiasm for life, fulfilling relationships, creative freedom, and a sense of well-being. Success is the ability to fulfill our desires with effortless ease. And yet success, including the creation of wealth, has always been considered to be a process that requires hard work, and it is often considered to be at the expense of others. We need a more spiritual approach to success and to affluence, which is the abundant flow of all good things to us. In spiritual terms, success is measured by how efficiently, how effortlessly, we co-create with the universe. Hard work, struggle, and frustration are the opposite of what the ancient sages taught; they knew that spirit lies at the source of all achievement in life. They always began at the source, and they defined the source as pure potentiality, which is purely unmanifest consciousness. The beauty of beginning at the source is that power resides there — the power of our inner being, the power of our spirit. In every seed lies the promise of a forest. Unseen energy flows into material manifestation. The physical laws of the universe are actually the process by which the unmanifest, unknown, and invisible is transformed into the manifest, known, and visible. Our most cherished desires are pure consciousness seeking expression from the unmanifest to the manifest. And if we give our deeper instincts a chance, success in life is not only possible, but inevitable. With the knowledge and practice of the seven spiritual laws, we align with nature’s intelligence, and our dreams and desires are easily fulfilled. When we understand these laws, and apply them in our lives, anything we want can be created.